Tweetgrade is a new Twitter analysis tool from Purewire and they have used it to analyse Twitter engagement statistics across 7 million Twitter user profiles. The Purewire findings are hot on the heels of Brand Republic reporting that 'more than 60% of Twitter users abandon the service after one month' and the BBC publicising a Harvard study of 300,000 Twitter users that showed that 10% of Twitter users create 90% of the Twitter content. Purewire also found that many Twitter users "have abandoned their accounts shortly after creating them, and a significant percentage are not showing signs of account activity". These figures seem to indicate that there is a big difference between the numbers joining Twitter and the number of people who actually use it. 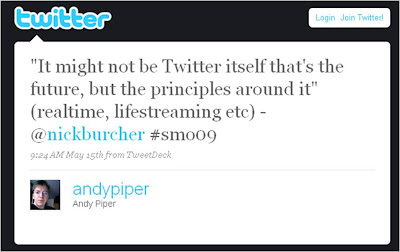 It also shows how far Twitter has come from its roots - at the outset it was about conversation, now it feels more like a place where people observe / receive content, rather than create it themselves. Whilst the huge (voyeuristic) celebrity followings have clearly contributed to this emphasis change, it doesn't mean that Twitter is on the decline, it just means that as time goes on advertisers / publishers intent on using Twitter for marketing also need to evolve their thinking - understanding that the majority of people would prefer to 'watch' rather than engage. 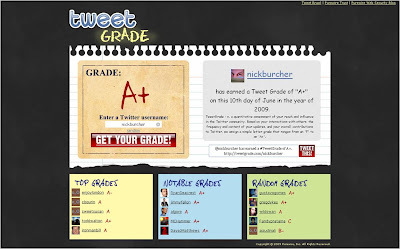 Try TweetGrade for yourself here. This is a theme that Jon Burg has explored in his post 'Twitter: Why you shouldn't care about the numbers.' Jon writes 'I don't know that Twitter will be where we socialize in 2020. But I do know that this user behavior is not going away' and I think this is the key point. Yes, Twitter may have seen astronomic growth / a big spike in new users in the early part of this year as celebrities jumped onto the bandwagon and the 'Oprah effect' filtered through, but the principles it follows (conversations and open connection in real time) are more than a fad. Twitter influence can be seen everywhere from changes to Facebook to redefinitions of search algorithms and most importantly, to the way consumers express their opinions and brands are now having to react. Twitter has speeded everything up, as well as facilitated virtual connection like never before and changed the dynamics in the relationship between consumers and brands. The recent figures may show it falling out of favour with some, but the pervasiveness of the Twitter way will continue to increase - as Jon says 'forget about the numbers'! What I take out of this is the idea that twitter is a hugely useful and important service (I love it), but that it's not for everyone. There are also strong parallels with Wikipedia - many readers, much fewer active contributers. Thanks for this link Dan - I have updated the post a bit now too. I agree that it may not be for everyone, but think the effect of the 'Twitter way' is more far reaching, truly changing how the internet works and the relationship between people and companies. Thanks for sharing! How's it going over the UK?